After finally getting their wits about, Samsung has formally apologised to its customers for the terrible fiasco caused by the exploding Note 7. They did this in the old-fashioned style, by publishing full-page ads in paper editions of U.S. daily’s The New York Times, the Wall Street Journal and the Washington Post this Monday. 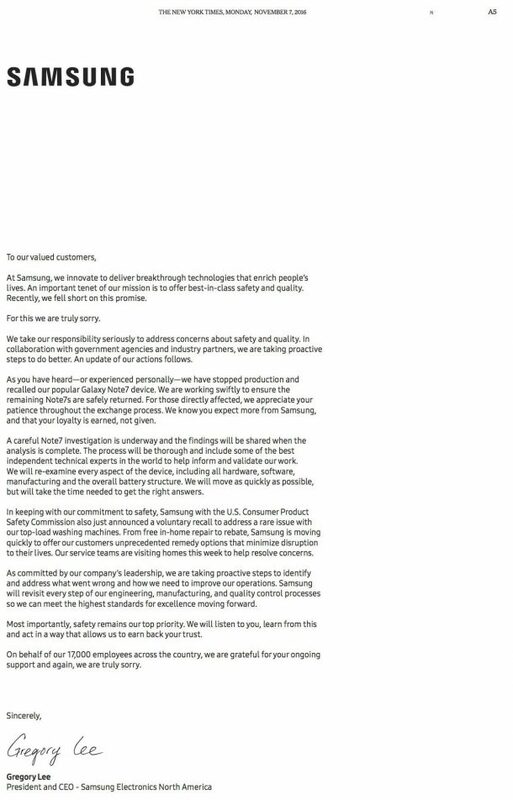 CEO of Samsung North America, Gergory Lee promised to launch a “careful” investigation about the causes behind the crash and burn of Note 7, which shows their commitment towards keeping their customers informed and assured. But it also shows that up till now, Samsung has failed to clearly identify the cause themselves. He also pledged to make all the investigation findings public, which would be essential to determining their future market prospects considering that up till now, all the statements have been rather vague, adding to the misery. The fiasco started when a Note7 burst into flames in an Australian hotel room. Since then, there have been an uncountable number of such incidents. All the social media pressure and danger of facing a serious lawsuit forced the company first to try and repair the phone, and then launch a total recall of the phones. Samsung needs some miracle now to win back its customer share, especially with its Note8 release approaching fast. It also has faced a severe dent in its repute after 34 models of its top-load washing machines, which were sold between March 2011 and November 2016 also exploded, leading to nine injuries.